Due to work offshore, I had been living in a fully air-conditioned quarters and office. It has been 2 weeks and there will be another week to go before I am off. Since the air conditioner is centralized and it is always on full blast, it has caused major discomfort. 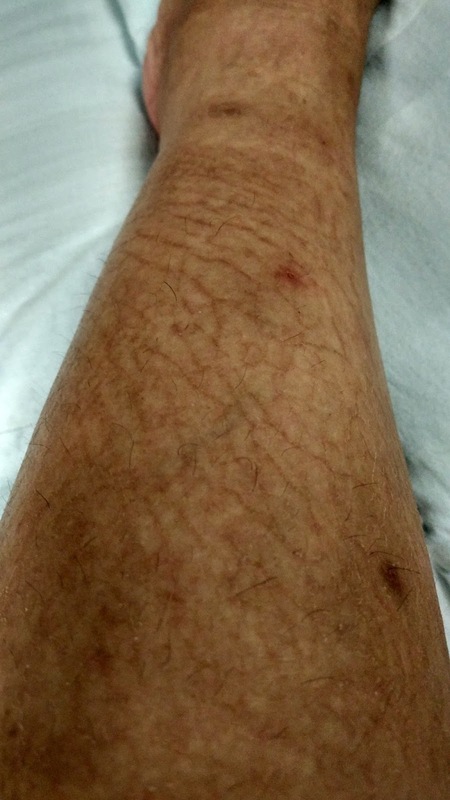 My Ichthyosis Vulgaris (IV) is considered to be quite minor, thus I have never mention this during my work medical check ups, on whether I am fit for (this) work. I have no major problem in my past assignments, at least the room temperature was controllable. However this time I felt additional discomfort, probably also due to a more haywire sleeping routine (also during the odd working hours I had been sleeping 5-6hrs per day). Or, maybe I brought the wrong lotion. Remember in the last post I mentioned on testing out the Rosken for dry skin, it was totally a mistake to bring this lotion which I have never tested prior. despite mentioned for dry skin, it was not helping at all, dried out so fast that I had to request for another bottle of lotion from the medic on board. Fortunately there was one bottle left on his shelf, the Nivea lotion for dry skin, which is even milder than the Rosken. So since I had to reapply my lotion every 1-2hours, I am currently layering these 2, probably used up half of my new bought Rosken in just 2 weeks. There is no other choice but to bear with it right now. I have always dislike being in air conditioned room for long hours, it worsens IV, just like being in cold dry climate. The air conditioner has never been this cold, this time even the Canadian said it is freezing, having experienced below zero temperature for few months a year, you know sometimes it is unbearable (especially now that it is Monsoon season). Below images are quite graphic, I just want to share how external factors can affect IV, and here exposed to continuous air conditioner for 2 weeks. 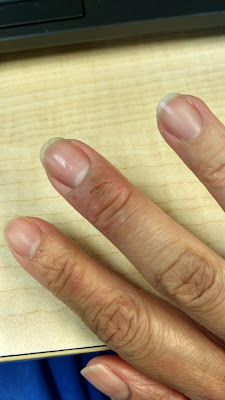 I had serious dry skin with rashes, no particular eczema break out, it just happens to the whole body. You could stop reading here to avoid getting too much info and graphical contents. 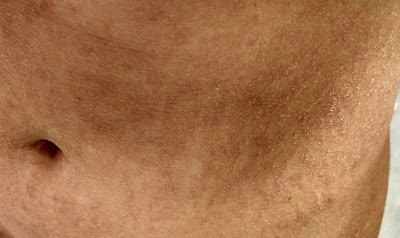 Reddish lines appeared around my torso area which looks very much like stretch marks except that they are not, they are just rashes and/or dry skin making crack like lines. All around the torso till my back and thighs. These minor crack lines have always been there but less obvious on usual days before exposed to air conditioner. After being so dehydrated (but I drink a lot, and I have read that water intake does not make IV or eczema better), the reddish cracks got more and more prominent, the lines kinda "pops" up and you can feel them on the skin surface. Can you see the crack on my middle finger? Close to my nail. The crack appeared along the lines, and the other 2 lines seem like they are gonna crack too. This is because it is so dry whenever I move my fingers the skin tear 😭😭 Sometimes it hurts a bit but no nothing much to do except to keep it moisturized.